Why is the RUSK Engineering Professional Straight Iron so Effective at Straightening Hair? Are you familiar with one of the top names in hair styling products? All of us here really like Rusk Engineering hair tools. They have a reputation in the business for putting out quality hair tools that are as good as or better than their closest competition. That is why we are always excited to take a closer look and review one of their products. Today we have decided to take a look at the RUSK Engineering CTC Technology Professional Straight Iron. This is a very nicely designed straight iron with 1 ¼” wide titanium heat plates. 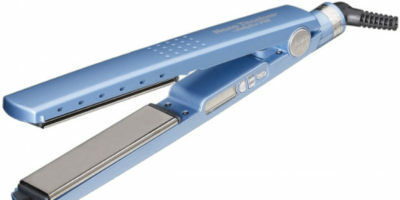 This size plate will allow you to both straighten and curl hair with it efficiently. It also allows you to get in close to your roots for maximum straightening effect. There are some very innovative technologies built into this flat iron from Rusk Engineering too. It features both advanced CTC Technology and Rusk Engineering’s own Sol-Gel technology. It has a simple push-button temp selection process and you can choose from 5 different temperature settings between 300ºF to 450ºF. The lower settings are real compatible with fine hair because they will lessen the chance of damaging it as you straighten your hair. It only takes a short 40 seconds before this flat iron gets hot enough to use. The RUSK Engineering Professional Straight Iron also has a memory function which will have it come back on at the last temperature setting it was used at. This flat iron only weighs 17-ounces so you won’t have any problems using it for a long period of time. 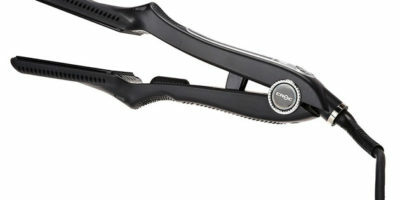 As we said, its slim design lets you get in close to your scalp to really enhance your hair straightening experience. The RUSK Engineering Professional Straight Iron also comes with a long 9-feet power cord with swivel end and a stay-cool Ryton plastic housing which is a nice bonus you get with this flat iron. Thai advanced ceramic titanium heat plate infusion accomplishes several different things. It enables this Rusk flat iron to heat up fast and retain an even temperature across the entire plate surface. This eliminates hair damaging hotspots. This technology also helps with moisture retention and adds a bit of nice shine to your hair as you straighten it too. This is another effective coating for this flat iron’s heat plates. Its role is to keep hair from catching on the heat plates. When your hair can glide easily across the hot plate surface it is much less susceptible to damage while you are straightening it. The warranty on this item is around average for a flat iron in its price range. Rusk engineering backs it up with a 2-year limited warranty. One disappointing thing about this flat iron is that it does not have an auto-shutoff feature. For a company that has built a straightening iron with just about everything included on it that is surprising. There were also a few complaints that the 1 ¼” wide plates were too big for short hair users. We are all in agreement that this Rusk Engineering product is a top of the line straightening iron. This is especially true if you are using it for your fine or medium hair types. It includes such hair compatible features as advanced CTC Technology, titanium-infused ceramic plates, and Rusk’s own Sol-Gel technology too. When you add to that its wide operating temperature range and its 40 second ready time with heat setting memory, it really makes this a highly recommended flat iron choice for us.